Hello. We are rapidly approaching December which means it’s time for Diptyque’s holiday collection which I also refer to as Merry Christmas from me to me. 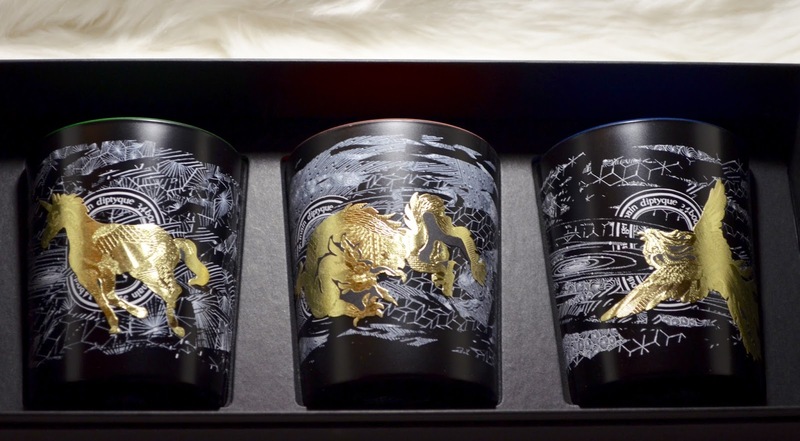 Diptyque’s holiday theme this year is the constellations and their mythical animals the dragon(Fiery Orange), the unicorn(Frosted Forest) and the phoenix(Incense Tears). The animals were designed by artist Philipe Baudelocque. His images depict particles and light drawn in chalk on a black board to represent the skies as they stretch above the travellers they watch below the night sky. 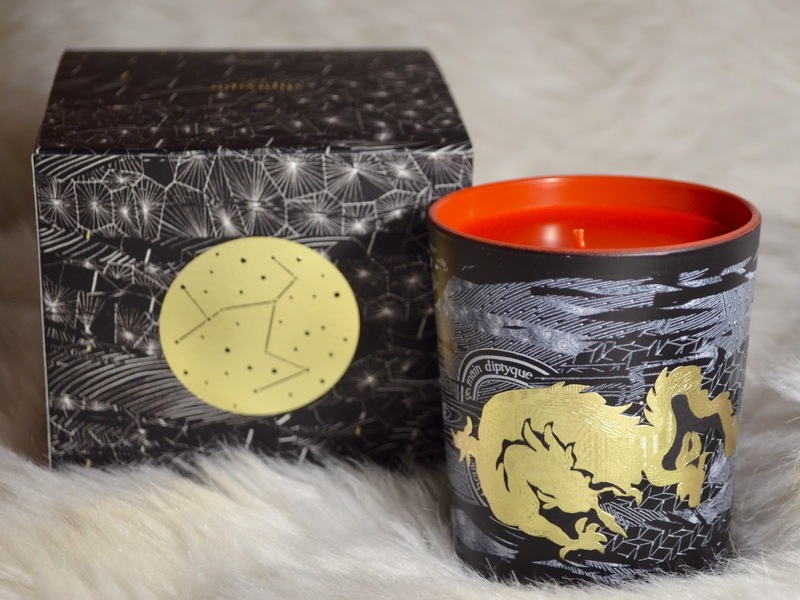 The notes for the dragon candle(Fiery Orange) are blood orange, smokey woods and cloves. I am burning the dragon candle in my bedroom now and it smells warm and spicy yet subtly sweet. I think this one is perfect for this time of year and I plan to buy a back up. Legend has it that Athena during a battle grabbed the dragon by the tail and threw it into the heavens where it remains to this day. 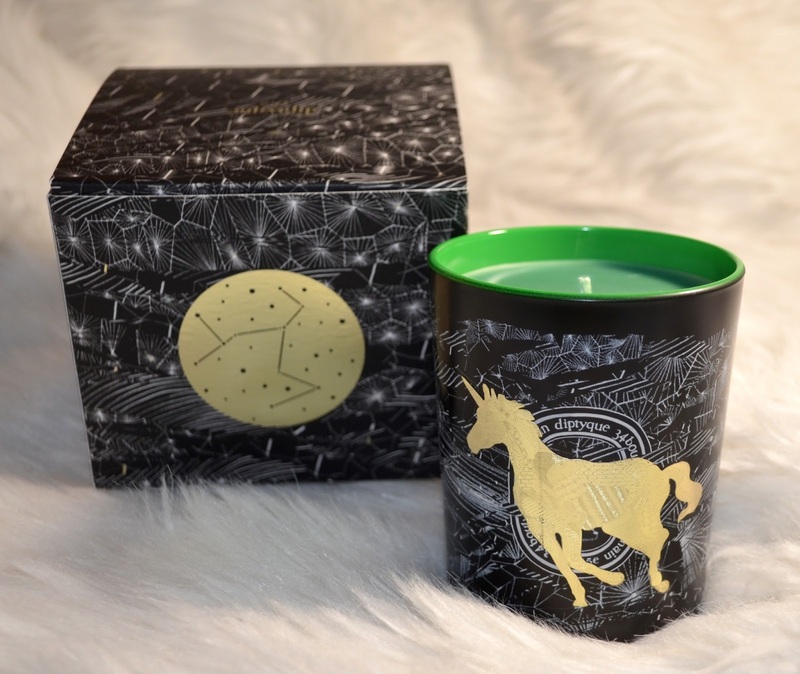 The notes for the unicorn candle(Frosted Forest) are fir needles, hinoki wood and mint. 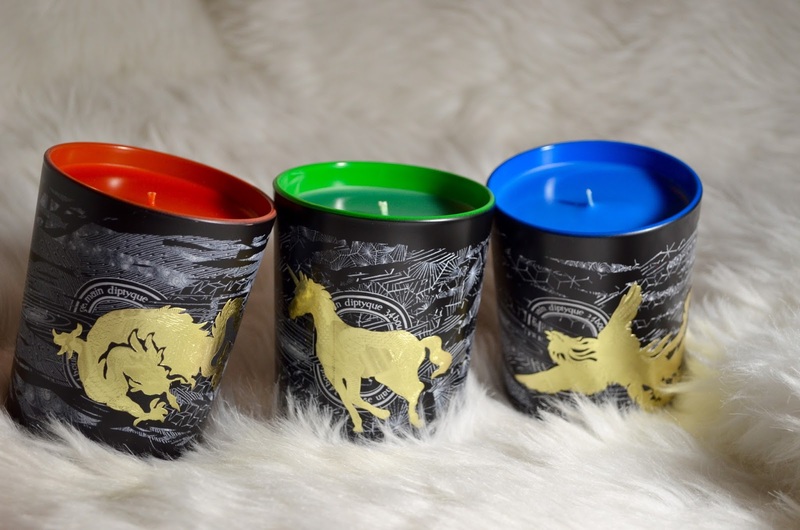 I think the unicorn candle has the most traditional holiday smell. Maybe it was the fir and the mint because although those two together smelled nice it wasn’t particularly unique. It reminded me of just about every other fresh pine candle I’ve ever smelled. I suspect I will enjoy this one more if I burn it along one of the other two candles instead of using it on it’s own. There are no legends associated with the unicorn constellation. It was discovered by the Dutch theologian/astronomer Petrus Plancius in the 1600s. The phoenix candle(Incense Tears) is a blend of incense, myrrh and cinnamon. This one surprised me. I expected it to be somewhat similar to the dragon candle(Fiery Orange) due to the myrrh and cinnamon. Instead I found it to be delicate, airy and relaxing. It smelled more marine than end of the year holidays to me. This one would make a great year round burn. The phoenix is the symbol of rebirth. Legend has it that the phoenix at the end of its 500 year life cycle would build a pyre out of twigs and spices and allow itself to be consumed by the flames. Out of the flames a new phoenix would be born. 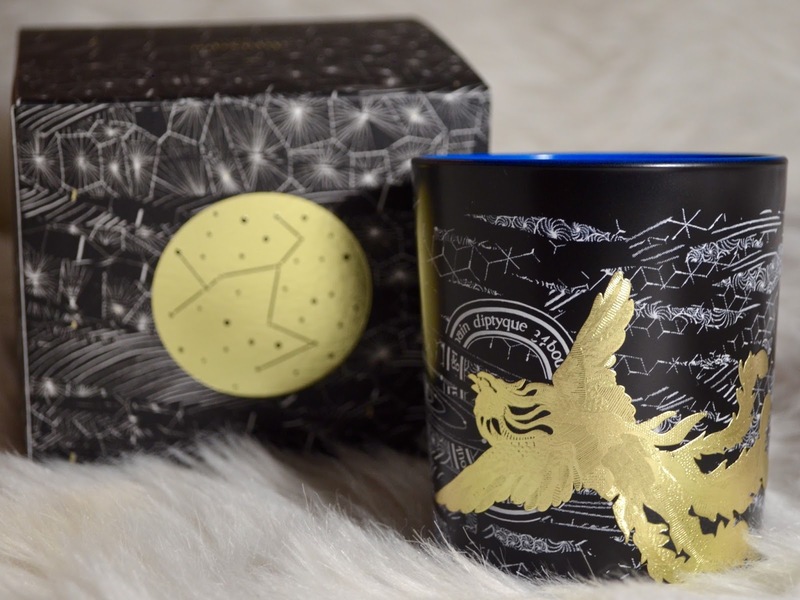 The constellation carousel fits atop Diptyque’s 70g candle and is powered by the heat of the flame. I know… cool right! 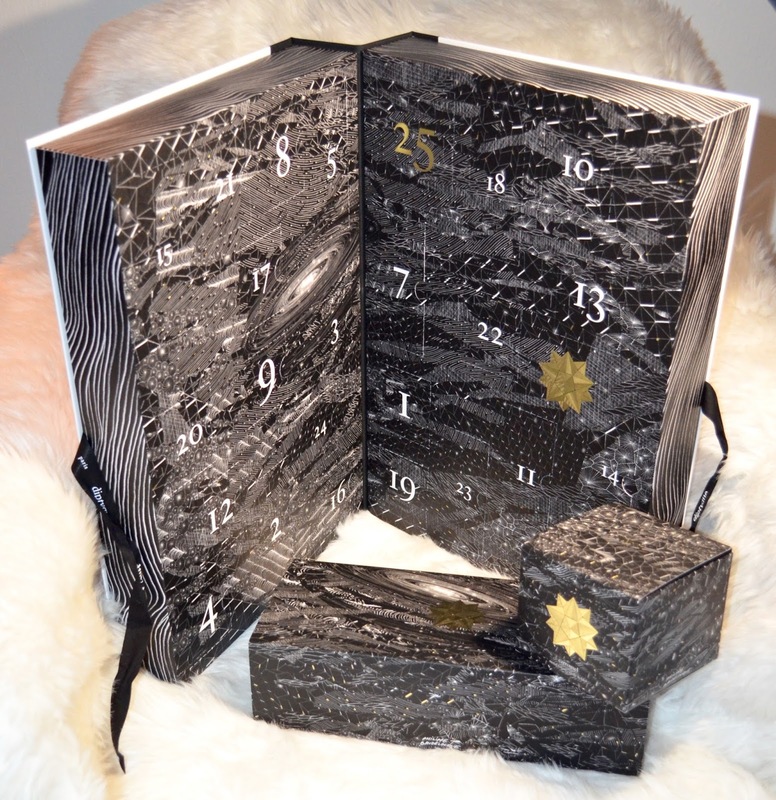 Last but not least is the Advent calendar that I was really excited about getting this year. When it sold out last year before I could buy it I set myself a reminder to make sure I got one this time around. I was that serious folks. If you are not familiar with an Advent calendar it’s a special calendar used to mark down the days of Advent in anticipation of Christmas. In the calendar pictured above every number marks a perforated box and behind every box is a small Diptyque product that’s the gift for the day. (Insert squeal here 😆). I’d love to give you guys a sneak peek but I’m looking forward to opening each box on the days leading up to Christmas so I’ll have to do some type of a recap instead. I said it last year and I’m saying it again this year. 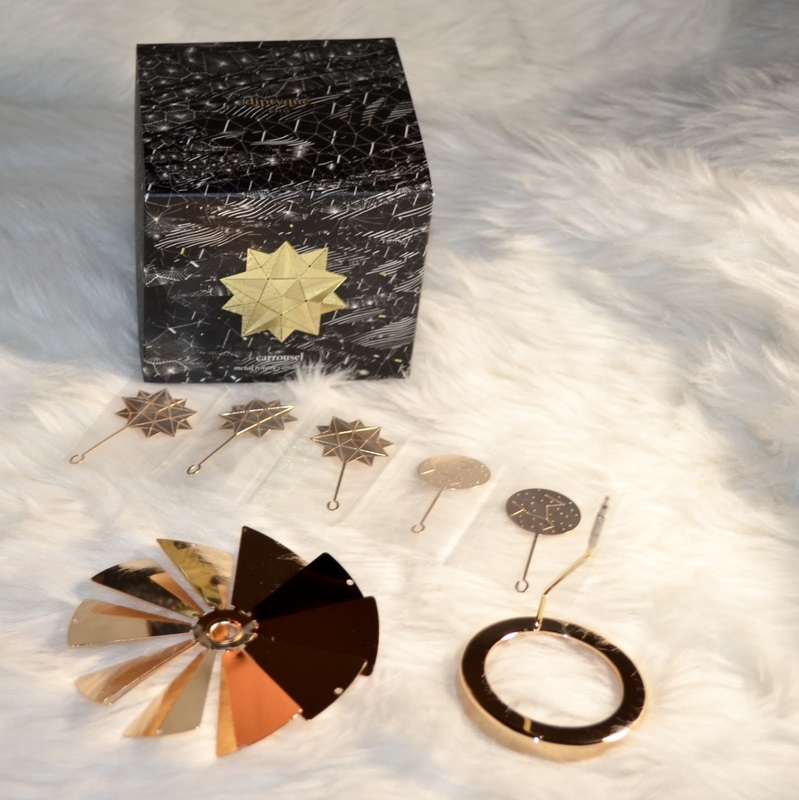 I love how creative the Diptyque holiday collections are. 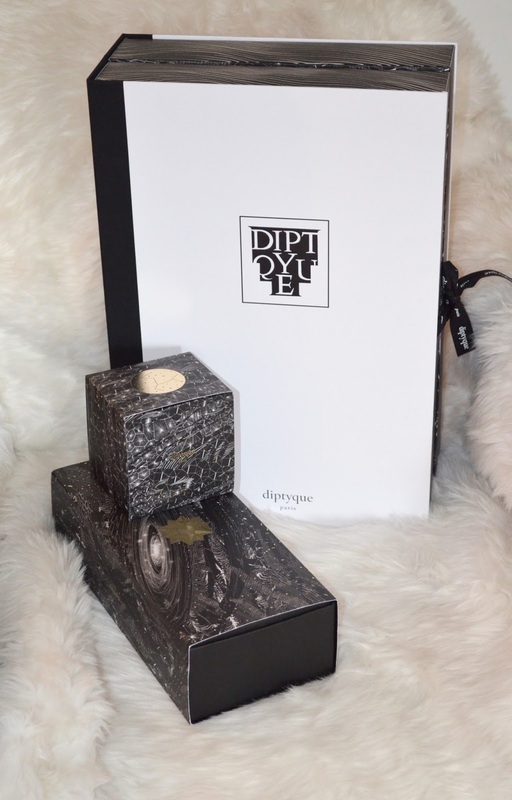 You can see a cool video about the 2017 Diptyque collection here, and my review of the Diptyque 2016 collection here. The packaging is breathtakingly beautiful, to say the least. 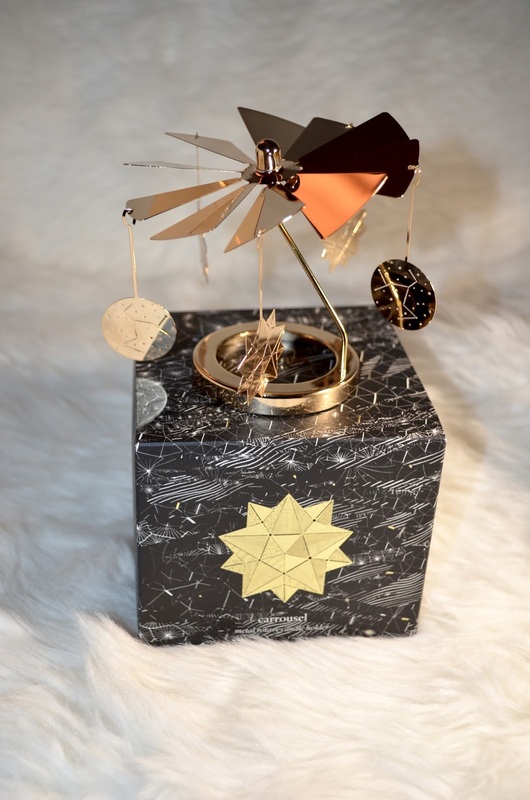 And the constellation carousel makes me want to go get the whole collection. I am sure the smell divine for the price. LOL!Have a wonderful week! Hi Nerline! I love the packaging too. If you pick anything up let me know ☺️. A very pretty collection indeed! I'm always thinking about Diptyque candles now and everyone I've asked who have tried them always say that they really are nice. I think I have my mind set on Gardenia. The carousel is so pretty – I love how they put so much effort and thought in their line :O)! They really go all out. 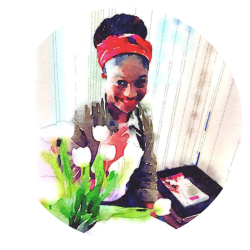 I've tried Gardenia and I liked it.